Thailand. Not only is Thailand incredibly affordable, but it’s a definite bucket list place, and I don’t just say that because they serve their rum in literal buckets. I say this, because life in Thailand is so very different from how we live in Canada that it’s hard not to be in complete awe the entire time you’re there. Bustling city streets full of tuk-tuks, and night-markets selling food on a stick for mere pennies, to tropical beaches and never ending nightlife, Thailand has everything. Ride an elephant or visit an uninhabited island, maybe dive off a waterfall or try a plate of freshly stir-fried spicy cashew chicken, all for next to nothing. Accommodation in Thailand are, if you’re willing to try a hostel or rent a condo or share your space, so inexpensive you could stay there twice as long as you might stay in Mexico and pay the same amount. 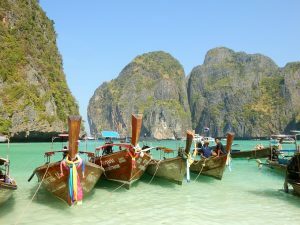 Thailand is geared toward younger backpacking travelers, so the price point for just about everything is within a student’s budget. The tricks are to stay away from the tourist traps, stick to hostels or shared accommodations and eat what the locals eat. You won’t be disappointed with that fresh chicken satay you just bought off a street vendor. Trust me! Koh Phi Phi - This tiny boutique island is a hotspot for backpackers and fans of the movie, The Beach, which was filmed among the islands near Koh Phi Phi. The floating markets in Bangkok - Take a canal tour in a longtail boat and see one of the few markets in the world that is located entirely on water. Phuket’s Bangla Road - The party never stops here! Whether you’re into Muay Thai fighting, grabbing a beer or heading to the beach, everything is a party on Bangla. Cambodia. Thailand’s close neighbour, Cambodia is even more affordable. It’s another backpacker’s destination, but because it’s not quite as popular as Thailand, you can find yourself paying even less for everything. There is also still an element of fear Westerners have when it comes to Cambodia. Once a war-torn country, landmines used to be a concern when travelling there, but no longer. These days, visitors to Cambodia testify that they wouldn’t even hesitate to bring kids there. As long as you bring your common sense along, it’s as safe to travel to, if not more, than Mexico. You will see a different way of life, that’s for sure, but you will not be taking any more of a risk travelling there than you would Fiji or Thailand or Indonesia. Angkor Wat - The “largest religious monument in the world” according to Wikipedia, Angkor Wat is a nest of temple structures, nestled deep in the jungle, that is rapidly being swallowed up by the nearby flora. It dates back to the twelfth century and began as a tribute to the Hindu god, Vishnu. Since then, it’s changed to a Buddhist temple compound. It is one of UNESCO’s world heritage sites and one of those places you’ll never forget once you experience it. Phnom Penh - Cambodia’s capital, sitting snug next to the Mekong River, is a must see destination, and one of the most affordable ones. Koh Rong - 43 kilometres of white sand beaches? Yes please! Koh Rong is an island in the Gulf of Thailand that rises high out of the water. Its hills are covered in lush forests and hide waterfalls throughout. A true paradise, Koh Rong is a place you need to see! La Concha - Located in the foodie destination, San Sebastian, La Concha is a breathtaking beach, considered one of the most beautiful in all of Europe. The Sagrada Familia - A project that began in the late 1800s and is still yet to be completed, the looming, impressive basilica is a sight to behold. Alhambra - This seemingly never ending palace presides over Granada and has since the 14th century. The Taj Mahal - Yes, I know this is a no-brainer, but it had to make the list. This stunning structure will absolutely blow your mind. The Ganges - This mighty river is thought to be sacred in Hindu culture. It is also home to the endangered Ganges River dolphin. Humayun’s Tomb - Located in Dehli India, this tomb is the final resting place of an emperor who lived in the 16th century. Slanchev Bryag - Otherwise known as Sunny Beach, Slanchev Bryag will surely fool you into thinking you’ve landed in Tahiti. The beaches will take your breath, and the nightlife will take your sleep. St. Alexander Nevsky Cathedral - A Bulgarian orthodox cathedral, the St. Alexander Nevsky Cathedral was built in the early 1900s. 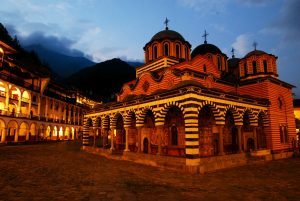 The Rila Monastery - Another UNESCO world heritage site, this monastery was built in the 16th century. An affordable vacation doesn’t always mean a dull one. Here we have picked five exotic places to visit that won’t break the bank. This year, I hope you leave the all-inclusive box and head out there to see our world. You definitely won’t regret it, and you won’t come home to insurmountable debt. So, where are you planning to travel to this summer? Let us know in the comments!